The birthing ball is the most important tool you need to prepare for natural childbirth. Each Mom-To-Be should begin using a yoga ball as soon as she enters her second trimester. This is the time in your pregnancy when you feel more energetic, less nauseous, and more relaxed. Now is the time to begin thinking about your birth and prepare for it. Learning how to use a yoga ball helps you prepare for labor physically and mentally. There are some important yoga ball poses that you need to learn really well because you will definitely need to use during labor. If you are interested in learning more, the Birthball Handbook is a great resource. 1. Pelvic rocking on the birth ball helps to ease contractions. 2. If your labor needs to be monitored you can have both internal and external monitors while on the ball. 3. The birth ball helps you to shift your weight to find comfort. 4. Sitting on the ball helps take advantage of gravity during contractions. 5. The birth ball helps you relax and speed up labor when stalled. 6. Using the birth ball during labor allows resting positions that help you rest in between contractions. 10. Prevents haemorrhoids formation during labor. As an added bonus you can continue using the birth ball after you give birth. I used to love bouncing on the ball holding my newborn baby. The rhythmic movements used to soothe them and put then to sleep. The following are easy to learn poses you can do with your yoga ball during labor. During labor you should sit on the birthing ball each time you feel like it, but especially during contractions. You should sit on the ball and then lean forward with your harms on your bed. Make sure your legs are on a 90 degrees angle and that you are moving forward with your torso to allow room foe baby as he or she prepares to descend the birthing canal. This pose is great to use during labor because it helps open the pelvis and encourages the baby's head to fit through your pelvic bones. Sitting on the ball in this pose is very relaxing and helps you get through your contractions. Make sure to breathe gently in through your nose and out through your mouth. It usually takes about 2 minutes for each contraction to pass. This time seems like an eternity while in pain. The more tense you become, the more pain you will feel. The trick is to let go and allow your body to give in to the contraction. Consider that 5 yoga breaths is the time of a contraction. If you need, your labor couch or doula can give you a back or shoulder massage while in this position. Rubbing your shoulder during early labor is known to help labor to progress. If your labor is slow to kick start, stalled, or non progressing, a shoulder massage can help induce labor. This pose gives your birth attendant easy access to your lower back for counter pressure massage. You can rock back and forth and side to side to help ease the pain. If you have back labor, this position will help ease the pain and your labor couch can provide counter pressure massage to help you. Most birthing Moms love this position because the softness of the birthing ball helps ease the pain of the contractions. When your are in acting labor and the contractions come 2 minutes apart, it is time to move from this position into your acting birthing position, which is usually on top of your bed on hands and knees or kneeling on the ball. As your labor progresses and you are moving into your active stage just before the pushing stage, you can use this position. Kneel and lean forward on the ball. This position is still very comfortable, but it puts you in a more advanced labouring stage helping speed things along. Place a pillow beneath your knees to help you feel more comfortable. You can even put the birthing ball on the bed. I have done this and it works fine. This position puts you on hands and knees with support and really helps if your baby is posterior. This pose helps baby rotation because it provides your baby with more room. Roll back and forth while on the ball during contractions. You can also roll side to side. This rolling movements help push the baby down the birth canal and find the best position for birth. Rolling on the ball is very relaxing and can be used in between contractions. If your baby is not head down, this position may do the trick. It should be done as often as possible during the last weeks of pregnancy and during labor. This exercise helps in preparation of labor. Also, this pose can be used during labor to help the baby descend into the birthing canal. 1. Place the ball between your lower back and the wall. 2. Lean back against the ball with the small of your back. 3. Place your hands in front of you or on your thighs. 4. Slowly bend your knees into a squat position. Make sure to keep, keeping your knees aligned with your ankles and squatting no lower than your hips. 5. Press gently against the ball and feel it roll up your back. 6. Straighten your knees back to a standing position. Sitting on the ball during labor helps your contractions stay strong and regular, speeding up labour because it allows baby's head to push on the cervix and dilate faster. By sitting on the birthing ball and leaning forward during labor you increase the room your baby has inside your pelvis. This supported squatting position helps baby's journey down the birth canal. This decreases baby's destress. Never stay in a reclined position during labour for long periods of time because this can increase painful contractions due to the pressure on the nerve of the sacrum. So, stay off your back if you can and sit on the ball to prevent putting pressure on the pelvic nerves. 1. Use you birthing ball as much as possible during the entire labor. 2. Make sue you are familiar with your ball exercises before you go into labor. 3. If you go to the hospital to give birth, bring your own ball. 4. Ask for help while sitting or standing from the birthing ball. 5. If you are not comfortable using the birth ball, do not push yourself. Listen to your body. To learn more yoga ball moves to use during pregnancy and labor, I recommend getting the Birthing Ball Workout Handbook. 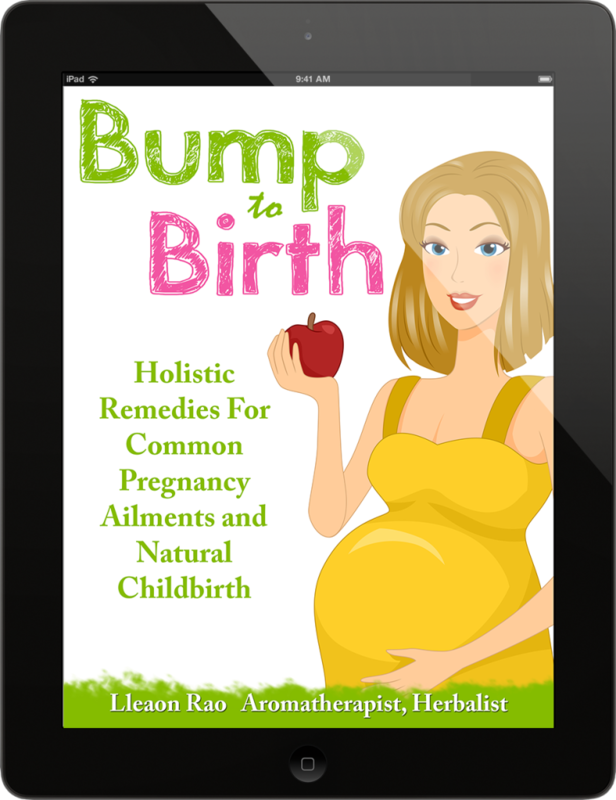 This eBook is a great and easy-to-follow guide on how to use the birthing ball before, during and after labor.